How Spanish guidebooks describe my city.. NY, NY! En el terreno cultural del ultimo siglo siempre ha side una ciudad puntera con movimientos como el expresionismo abstracto en pintura, renacimiento de Harlem en artes visuales y literatura, el punk, el hip-hop y el documentalismo fotografico entre otros muchos. 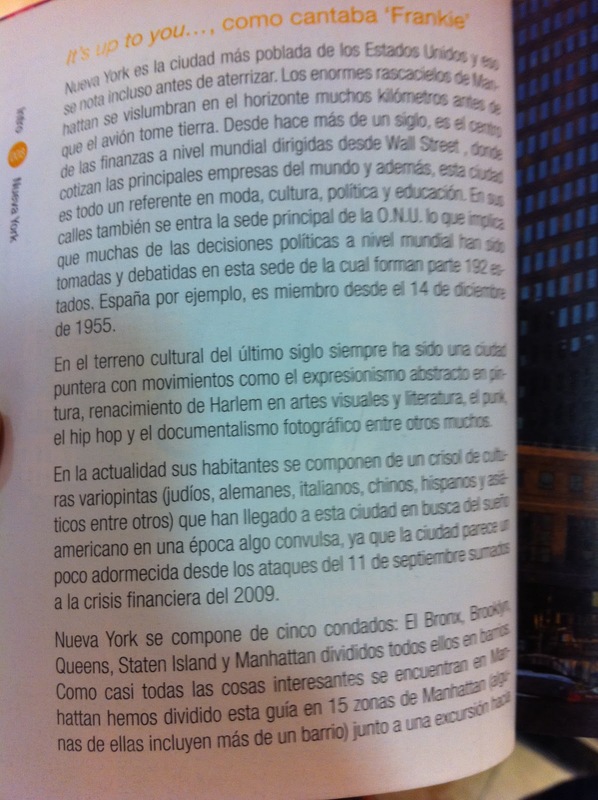 En la actualidad, sus habitantes se componen de un crisol de culturas variopintas (judios, alemanes, italianos, chinos, hispanos y asiaticos entre otros) que han llegado a esta ciudad en busca del sueno americano en una epoca algo convulsa, ya que la ciudad parece un poco adormecida desde los ataques del 11 de septiembre sumados a la crisis financiera del 2009. The last century has changed the cultural landscape of New York City. The city has experienced movements like abstract expressionism in painting, the Harlem Renaissance in visual arts and literature, the punk revolution, hip-hopculture, documentary photography and much more. Today, its inhabitants are composed of a melting pot (Jews, Germans, Italians, Chinese, Hispanic and Asian and others) who have come to this city in search of the American dream in a somewhat turbulent fashion, as the city seems a little numb from the Sept. 11 attacks combined with the financial crisis of 2009. Is this an accurate description? Does it shed light on the dynamics of New York City in a positive light? I think it is so difficult to accurately describe the dynamics and capture the rhythm of New York City in so few words. We not only have a melting pot of people, but languages, food, clothing, music, customs. In education, teachers must be sensitive to the cultural differences and background of each child. Teaching in the tri-state area is so enjoyable because I work with children and families from all over the world. Adapting and implementing multicultural classroom lessons is very interesting for myself and the children. These classroom exercises translate to lifelong lessons of compassion, generosity, understanding and patience. What a privilege it is to be from such a great city!